Robberies happen all too often in Canada. No matter what kind of business you own, you are susceptible to criminal behavior. 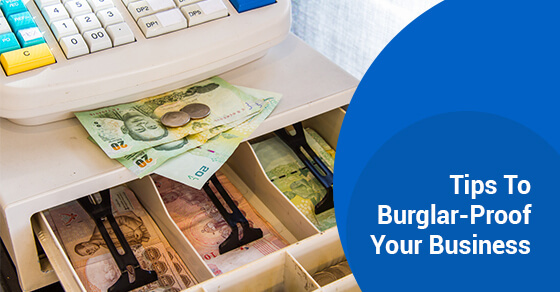 In order to keep hooligans from vandalising your property, stealing from your company, and creating an unsafe environment, you need to burglar-proof your business. If you’re not sure how to go about keeping vandals out, here are some very important tips. Closed-circuit television provides a constant video feed of whatever vulnerable spot you place the camera on. If you place cameras around the inside and outside of your business, you have a constant eye on what’s going on. Moreover, many criminals are deterred when they see cameras and won’t bother trying to rob you. Consider switching from traditional keys to card access. If one of your employees loses their key, you will need to replace it quickly and have the building’s locks changed. In the meantime, the criminal that found the key can easily break in. With card access, if a card is lost, you don’t have to replace the whole system, just cancel that card. If a criminal tries to get in with the stolen card the system won’t allow it. If your business is in retail, instruct one trustworthy employee to remove cash from the register at intervals throughout the day. The removed cash should be deposited in a safe, picked up by you, or taken directly to the bank. Only keep a little cash in the register, especially at night. You can also have a panic button behind the counter that your employees can push in an emergency. Place motion sensors with lights on the outside of your building. This will ensure that if someone is trying to break-in after hours they can be seen. Many businesses have gardens or beautiful landscaping around their building. If you do have greenery outlining walkways and parking lots, make sure that trees and shrubs are trimmed. This will get rid of any blind spots during the day. Deadbolts should be placed on all exterior doors. In the event of an attempted break-in a criminal cannot kick down a door that is fastened with a deadbolt. You should also install shatter-resistant glass on all exterior windows so that if someone is trying to get inside they can’t do so by breaking a window. The most important factor involved in burglar-proofing your business is purchasing a state-of-the-art alarm system. If you do not have one in place, you are practically inviting criminals to your location. Do yourself and your company a favour and get a high-tech intrusion monitoring system before it’s too late.